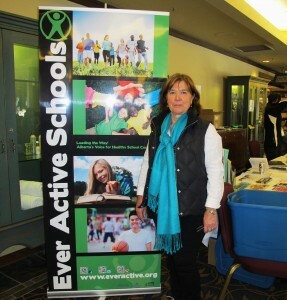 This week our colleagues in Alberta at Ever Active Schools held their 5th annual Shaping the Future Conference. Like our Healthy Schools Leadership Conference, now in its 8th year, (save the date it will be held Monday May 5th), the conference brings together a wise mix of people considering how best to inspire children and youth to be healthy learners. The pre-conference session hosted by Alberta’s Healthy School Community Wellness Fund was organized by the stages of the healthy schools process. In the “create a shared vision” stage, Bill Gordon took the time to remind us why we specifically were participants at the conference. He suggested it wasn’t because of our depth of knowledge in health but rather because someone acknowledged us as a role model when they saw our passion, love for the work and the laughter and respectful relationships we nurture and maintain. In “determining the priority issues” Gail Diachuk; Alberta’s Healthy Schools Coordinator brought home the message, it’s not only changes to learning processes but so too a cultural shift in the systems we work in in order to achieve our goal of healthy learners. Brenda also challenged us to step away from the 50 plus years of buying ourselves out of responsibility and to step into taking ownership for our health, well-being and how we can each make a difference. In her work with organizations and individuals she sees an emerging sense that people very much want to make a difference and are looking for ways they can contribute. She told us today’s leaders do not look for followers, they create other leaders. What progress have schools made on their school action plans? What new insights and learnings have been incorporated into the next version of their action plan? As I packed myself up to come home, I took another look at the beautiful natural environment that we had been learning in with plenty of time to connect with others and nurture our own health and wellness in outside spaces for walking, running, ice skating, cross country skiing to name a few, I was struck how the conference addressed so apply coined by Phil McRae “a preferred future”. Yes there is much to do, many journeys to travel but connecting it all a strong moral purpose, the healthy development of our children, families and communities. 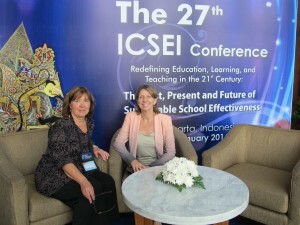 I’ve just returned full of reflection from my experience at ICSEI 2014 (International Congress for School Effectiveness and Improvement). The theme this year was “Redefining Education, Learning and Teaching in the 21st Century: The Past, Present, and Future of Sustainable School Effectiveness”. Together with colleagues Paige Fisher, VIU and Lynn Brown, HSN leader and SD 68 teacher, we were welcomed and greeted sincerely by the people of Yogyakarta, Indonesia. Their gentle presence inspired us as we were invited to join individuals from 37 countries to seek diverse perspectives and commonalities of problems and solutions. The congress keynotes featured Jim Spillane, whose research explores how organizational routines can develop leadership practice and improve student achievement and Karen Seashore, who posed the question “Whose public schools are these?” Karen shared an inspirational quote from Rumi, “Out beyond ideas of wrong doing and right doing, there is a field, I will meet you there”. Both confirmed DASH’s value of collaboration and shed light on our work in between the systems of education and health. Jill Jameson’s keynote asked the question “How can educators enable young people to cope with the difficult world they live in?” and subsequently addressed the importance of building trust at all levels. She made reference to visible and invisible aspects of leadership and shared the following quote, “to lead the people walk with them, as the best teachers, the people do not know of their existence… the people say we did it ourselves” (Lao Tzu). Her presentation reflected our work with others to promote connectedness as a foundation for all learners to realize their potential. Paul Clarke of Pop Up Farms, speaker at the 2012 Healthy Schools Symposium, made his presence felt in many of the gatherings at ICSEI 2014 as he reminded us of the real ecological crisis we share and urged us to cast away old models as we try to rethink and reconsider the role of schools in relation to nature, community and the planet. And perhaps best of all, to see our own Lynn Brown on the stage with international colleagues sharing her grounded, intelligent practitioner perspective in the plenary session Policy, Practice and Research Discussion. A highlight I will treasure and remember. I was pleasantly surprised to see a substantial focus throughout the congress on the need to rethink the role of family and community as we seek to create effective learning environments and a realization from many contexts that it’s been wrong to create school spaces that exclude them. The opportunity to visit schools is both a highlight and unique feature provided at the congress. My visit included an elementary and secondary school where the local traditions of food, music, dance, and batik were very evident and woven into the day as part of the learning experience. During the coming months, I look forward to sharing more of the wisdom and rich flavor of conversations at ICSEI. In closing, I’m so grateful to learn and work with so many colleagues who are inspired and passionate about making a difference for all BC learners. I’ve come to understand it isn’t what we get out of our work but rather what we collectively become as a result of it. I’m confident our collective commitment bodes well for our future.